The Miami Heat may not have the star power that other teams making a playoff push enjoy, but they do have one upper hand over the rest of the NBA. 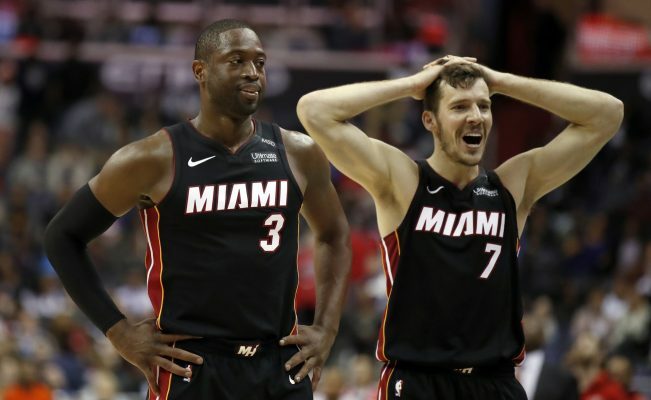 According to Barry Jackson of the Miami Herald, Dwyane Wade and Goran Dragic have been putting up stellar numbers together as the Heat’s backup backcourt unit. “Is there any NBA backup guard combination better than Goran Dragic and Dwyane Wade? Highly doubtful,” Jackson wrote. Jackson dove deeper into the numbers to prove how successful the Heat have been when the two former All-Star guards have been on the court together. “Now, the Heat is typically winning the minutes when they play together,” he wrote. “During the past five games, Miami has outscored teams by 38 when Dragic and Wade are on the floor together — the best two-man combo on the team. Dragic has been a missing piece from the Heat’s rotation for much of the 2018-19 campaign due to him undergoing knee surgery earlier this season. He’s only played in 24 games thus far, but it wasn’t long after his return in late February that his value to the team was realized. In Miami’s win over the Oklahoma City Thunder on Monday night, that value was on full display when Dragic recorded 26 points, 11 assists, and five rebounds. Wade was also highly effective in the win with 25 points, five assists, and four rebounds. Despite Dragic’s return, the Heat are still shorthanded with both Justise Winslow and Rodney McGruder still nursing injuries. However, the Heat have won seven of their last 10 games and are not only looking to hold onto their eighth seed in the Eastern Conference standings, but also possibly move up in the playoff bracket. If they manage to do that, Wade and Dragic will very likely continue to play huge roles.